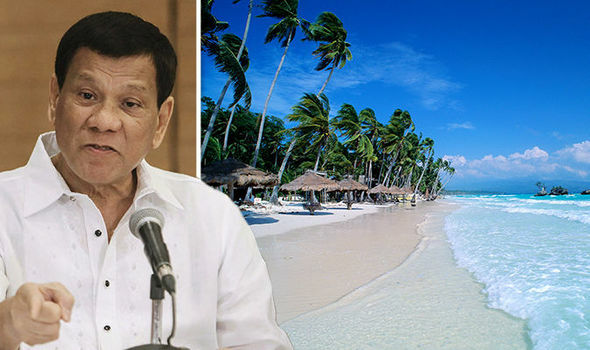 President Rodrigo Roa Duterte has been a center of controversy during the time when he denounced the island paradise of Boracay and decided to have it rehabilitated after being disgusted by its sewage-scented beach water. He was also criticized for being a hypocrite after critics and the Opposition claimed that the closure of the island was to make way for the construction of the Chinese Casino. Yet Duterte steadfast, made it clear that there will be no construction of a casino in Boracay. With present matters at hand, Duterte announced in a press conference after the 32nd Association of South East Asian Nations Summit (ASEAN) that he will also stay steadfast with the recommendations of the Department of Environment and Natural Resources Secretary Roy Cimatu, Department of Interior and Local Government officer-in-charge Eduardo Año and Department of Tourism Secretary Wanda Teo’s. "I do not interfere in the work of the Cabinet members. ‘Pag ‘yan ang sinabi ni --- that’s the recommendation of Cimatu, Año, and Teo then that is it. I do not just revoke recommendations. ‘Pag nag-recommend ang isang ano, Cabinet member, it’s a 90 [percent]. ‘Yung 10 percent na ‘yan kung may abuso lang o --- but seldom,” Duterte clarified. "Look, I’m trying to clean the place. Sinabi ko sa kanila sarahan. At hindi ako nakialam, sabi ni Cimatu, one entrance pati exit. In deference to the guys there who have lived all their lives there." "Hintayin lang ninyo. Do not be impatient. ‘Pag nalinis ‘yan, ibigay ko uli sa tao ‘yan,"
Duterte also clarified the fact that there is a lack thereof proper segragation of the island, may it be forestal, agricultural or commercial. "It would need a law or a presidential proclamation to segregate. Wala pa kong napirmahan. Neither sabi ni President Gloria Arroyo na wala silang pinirmahan na... setting aside a portion of the island as open to commerce, commercial area,” Duterte said. “Huwag kayong magpilit. Because ‘pag nagkagulo diyan, sarahan ko. As I have said, sa pagka ngayon, ang utak ko is I want to declare the entire island a land reform area. Ibigay ko na lang sa Filipino. How much? Five? Kikita tayo ng five million." "There will never be one. Even bingohan, saan nakita?" Yet, with full confidence, duterte stated that he will never let such a casino defile the island. “And since there are casinos there, they want to build casinos there. Hindi ako pumayag. Dito sa Davao, wala talaga. ‘Yung PAGCOR lang,” Duterte stated. Despite being faced with a tantanous amount of criticism, Duterte’s decision to have the island closed was one that made locals of other islands worry more about their own paradise. They have started to abide to the environmental rules and laws and have self-demolished their properties that violate it in any way, case-and-point would be the multiple municipalities of Coron, Palawan. This, most probably is the silver lining, setting aside the rehabilitation of the Boracay island, of Duterte’s controversial decision. In the end, with a little sacrifice, it’s still a win-win situation for Boracay Island, since the closure controversy would serve as great publicity and on top of that that island would live up to its name as an island paradise and not as a tourist’s worst nightmare.